​one another, in order to EXALT the Savior (Matthew 28:18-20). 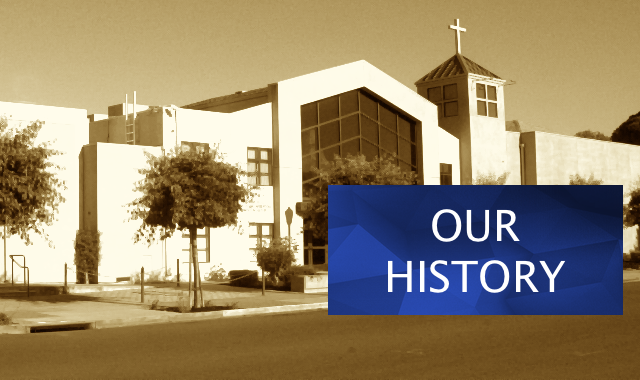 What a joyful privilege to share this brief history of St. John Missionary Baptist Church. Richmond’s history would not be complete without the history of St. John, the city’s second oldest black church. 75 years ago, God gave a small group of people a mind to come together and start a Prayer Band. In 1941, World War II had begun, and many of these people came to this area seeking employment. There was only one small black church in Richmond, and that church was on the north side of town. There were many black families coming to this city and that church wasn’t large enough to accommodate every church-going family. Several prayer warriors came together with a mind to praise God for His bountiful blessings. God blessed this Prayer Band and gave the members a mind to organize a church. They continued as a Prayer Band for another year, hoping the Lord would send them a minister with a vision to organize a church on the south side of town. During the latter part of 1943, God sent a young preacher, Reverend James Brown, who joined the Prayer Band. The Prayer Band had grown, and Reverend Brown told them that God had laid the burden on his heart to build or buy a building where God’s people could come together and worship Him. The Prayer Band felt this was the answer to their prayers and quickly agreed with Reverend Brown, so they gave him their vote of confidence to stand with him in this decision. Reverend Brown, along with others, went from door to door soliciting funds to buy the first building on 47th Street and Wall Avenue. In March 1944, the Prayer Band, along with others who joined them, marched from 2nd Street to 47th Street and Wall Avenue. Six weeks after marching to the new location, they called a meeting to decide on a name and chose “St. John Missionary Baptist Church.” This name was sent to our State Capitol in Sacramento for approval. Approximately six weeks later, a letter arrived from Sacramento stating, “if no other church in the area had the name of ‘St. John Missionary Baptist Church,’ ” we had permission to name the church St. John. Oh, what a joyful time it was! We were now officially “ST. JOHN MISSIONARY BAPTIST CHURCH. In 1944, Reverend James Brown was officially elected, by unanimous vote, as the first Pastor, but Reverend Brown left for St. Louis, Missouri in 1945. The Reverend Robert L. Johnson was asked to serve in his absence. When Reverend Brown did not return, the church chose Reverend Johnson to serve as Interim Pastor until Reverend G.E. Carter was called to be the second pastor. Under Reverend Carter’s leadership, the church was incorporated on March 1, 1946, and Reverend Carter served until 1947. Once again, Reverend Johnson took on the task of helping God’s people. We believe it was God’s will that Reverend Johnson become the shepherd over this small flock. Reverend Robert L. Johnson was elected Pastor in April 1948. Subsequently, St. John began to grow spiritually and numerically. We soon purchased property and built our first sanctuary at our present site – 662 South 52nd Street. The Lord continued to bless St. John. The membership grew, and in 1962 we began a building fund program to purchase more land for expansion and remodeling. In 1966 when the remodeling began, we worshipped with the Zion Hill Baptist Church until the church was completed. In 1969, God gave Reverend Johnson a vision that St. John should help the needy in our community. The church accepted the challenge and built the 158-unit St. John Apartments at 121 West MacDonald Avenue in Richmond. Other accomplishments under his leadership included the organization of the Board of Christian Education, the Home Department Sunday School for the sick and shut-in, a scholarship program, the prayer warriors, membership training, the Church Library, and the Bond Program to expand the sanctuary to accommodate the growing membership. God blessed the Bond Program, and on Sunday, June 19, 1983, we had our “On-Site Ground Breaking Service.” On Sunday, April 1, 1984, we had our “Entering Program” to our present sanctuary. Early Morning Worship Service (8:00 AM) was introduced. We also purchased a van and two lots across the street for parking. After 37 years of faithful service, Reverend Johnson’s health began to fail, so he felt the Lord wanted him to retire. Pastor Robert L. Johnson’s Anniversary/Retirement Program was held in May 1985. In July 1985, the church elected Reverend Lloyd Farr as our fourth Pastor, and he served until May 1990. Our fifth Pastor, Reverend Charles Belcher, was elected in January 1992, and he served until May 1992. Reverend Calvin Jones, Sr., was elected as Interim Pastor on February 1, 1993. The church continued in prayer that God’s will be done and that He would send us a pastor after His own heart. We believe God answered our prayers and sent us Reverend Kevin B. Hall. On July 29, 1994, he was elected Pastor of St. John. Reverend Hall’s installation was held on Sunday, September 18, 1994. Pastor Hall has foreseen our need for external and internal growth. He adopted as our theme, “A Kingdom Building Church In The New Millennium.” During his first year, the Lord blessed us to pay off our parsonage and we witnessed the genesis of another Building Fund Ministry for the expansion and development of our educational facilities. Also under the direction of Pastor Hall and the Christian Board of Education, Bible study classes were added for all age groups as well as training classes for ministers, deacons and leaders. Other accomplishments include the strengthening of the Tutorial Program and the inauguration of St. John’s Church Leadership Council. In addition, our Sunday School attendance has grown! Under Pastor Hall’s administration, many new ministries have been added to our church. Pastor Hall advises us that to be in the will of God, we must learn to tithe, fast and pray. He also reminds us that, as “A Kingdom Building Church In Two Communities,” we must go out and witness to the unsaved. Yes, we believe God sent Pastor Hall to carry out His divine plan for this church. We believe under the leadership of Pastor Hall, God has great works for His church. The Lord has truly blessed St. John in her 75 years as an organized body of believers. Praise God for another blessed year of total commitment to God’s service. St. John celebrates seventy-five years, and God faithfully sustains us in his name!